Scientific name: Bombyliopsis abrupta, Lixophaga sp. Aphids, armyworm, beetles, bollworm, bugs, cabbage looper, cotton stainer, cutworm, grasshoppers, hornworm, leafhoppers, mole crickets, moths, sawflies, scale insects, stem borers, stick insects (CABI, 2000). Eggs are ovate-shaped and white in color. They are found in the skin of the host insect or in leaves near the host and are hatched when the host ingests them. The larvae or maggots are worm-like and lack appendages like all other fly larvae. They are greenish-white in color. They have three larval instars and then leave the hosts to pupate in the soil. Before pupation, some mature maggots produce hard cocoons. The larval stage takes about 4 days to 2 weeks depending on the climatic conditions. The newly hatched larvae enter into its host and feed on the content before pupating into the soil. Some tachinid species are hosts' specific, for example for a certain species; it is parasitic only on leaf rolling caterpillars, or only on sugarcane stem borer. Pupae are oblong, yellowish and turn dark-reddish as they mature. Adults measure between 3 and 10 mm and have very stout bristles at the tips of their abdomens. They look very similar to the common housefly but are larger with stocky and soft bodies. They vary in appearance from gray black to brightly colored, or sometimes looking like bees. Adult Tachinid flies have only 1 pair of wings. They feed on honeydews and flower pollen. Different species have varied modified sucking type mouthparts: the cutting sponging, the piercing-sucking, and lapping-sponging. 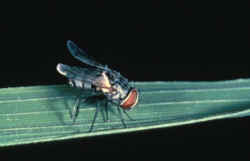 Adult flies are found in almost all crop habitats, either resting on foliage or feeding on nectars and pollen. Additionally for females, they search for hosts to lay their eggs. The female adult lays her eggs near or into the larvae, or on another insect. She can lay as many as 1000-2000 eggs in her lifetime. Adults can live from 3 days to 2 months depending on the species (IRRI, 2001). However, the Uzi fly (Exorista sorbillans or E. bombycis) is an important pest of the mulberry silkworm and other silkworm species in Asia (CABI, 2000). Reducing the use of insecticides and providing sources of food like dills, parsley, clover and other herbs are the most efficient ways to conserve Trachinid flies in agricultural ecosystems (Ellis; Bradley, 1996: pp. 328-329).